The regulations include exceptions when solar panels aren't feasible—such as on a home shrouded in shade—or cost effective. Installing storage batteries or allowing community-shared solar generation are available options. 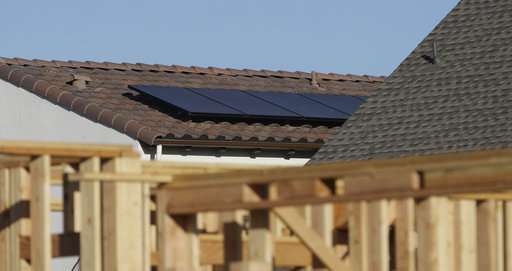 The requirement would only apply to newly constructed homes, although many homeowners are choosing to install solar panels with the help of rebate programs. Now faux-greens want to shove solar panels down people' throats full of arsenides and other chemical carcinogens that never lose their toxicity with time, worse than asbestos, just to provide "greenwashing" for natural gas(methane/fracking) in order to shut down a perfectly safe source of carbon-energy, it's a crime in the face of Climate Change. "...the state's latest step to curb greenhouse gas emissions." Solar and wind have failed miserably at reducing emissions everywhere even after trillions of dollars spent worldwide. Eco-talibans are forcing people to use useless placebos. "New Solar Roof Law Will Transfer Wealth from Poorer to Richer"
"California's new solar roof mandate will make housing more expensive, increase electricity prices, and transfer wealth upwards. What it won't do is significantly reduce carbon emissions"
"...has the second-most-expensive homes in the nation after Hawaii, and the third-worst state homeownership rate for millennials"
"solar roofs are twice as expensive as solar farms"
"California's top energy economists say the main driver of higher electricity prices is the state's heavy deployment of solar and other renewables"
"adding much more storage would only increase electricity rates more"
Whining will not stop progress. If solar panels were really so cheap and cool, it wouldn't be necessary mandates to coerce people to use these useless placebos. It's more an abusive form of providing "greenwashing" for the natural gas(fracking) industry to displace carbon-free nuclear energy. "According to business consulting firm Lazard, the net cost of energy from residential rooftop solar is twice that of solar panels on commercial and industrial roofs and as much as 10 times costlier than large solar farms." "The residential solar mandate for new homes ... definitely more expensive." Not even faux-greens organizations and eco-hypocritical celebrities use these placebos to power homes and vehicles. My panels work flawlessly, and have already paid off. Now, we get free power forever. The power companies know more about their business than Willie, who can only copy and paste. I can go out and watch my meter run backwards. 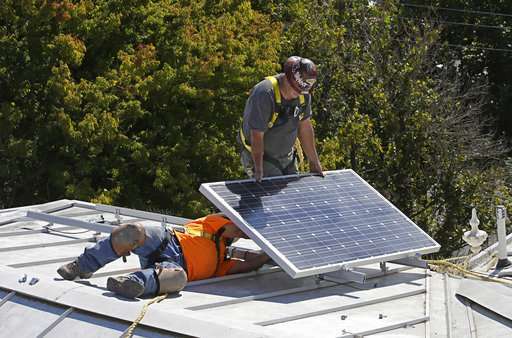 Poor Californian families have to subsidize rooftop solar panels and electric cars for Rich Eco-nuts to pretend they are still connected to the electrical grid powering the whole state.